Street art is not just for stationary walls any more. According to Kate Essig at WNYC radio, some pretty amazing specimens are now on the move. “Art in Spain got a sweet new set of wheels thanks to the Truck Art Project,” she writes. “In this collaboration between a transport company and the local art community, street art takes the form of stunning mobile murals on — you guessed it — trucks. “The goal of the project is to make contemporary artwork accessible to all, even if it’s just a surprise sighting at a stoplight — so those in Spain who aren’t frequent gallery go-ers can still glimpse this art on the go.” An inspiring array of truck-art photos can be seen here. 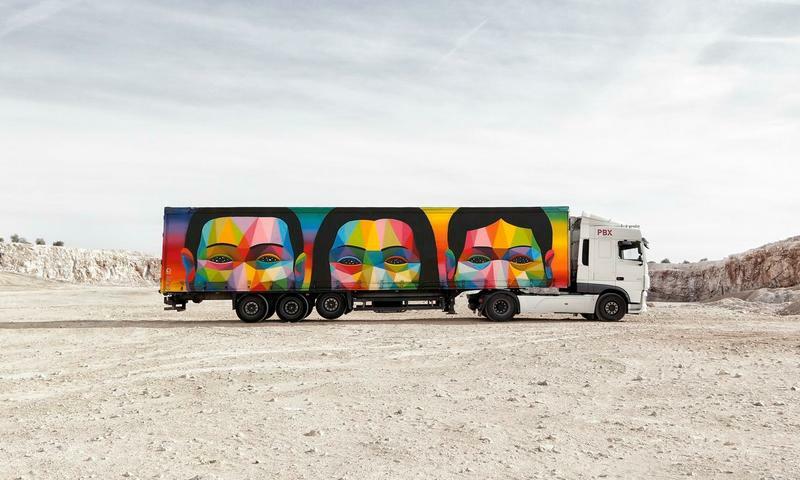 This freight truck was painted by artist Okuda San Miguel for the Truck Art Project.